Conium maculatum inflorescence. discoverlife.org.jpg (Accessed 12/2014). 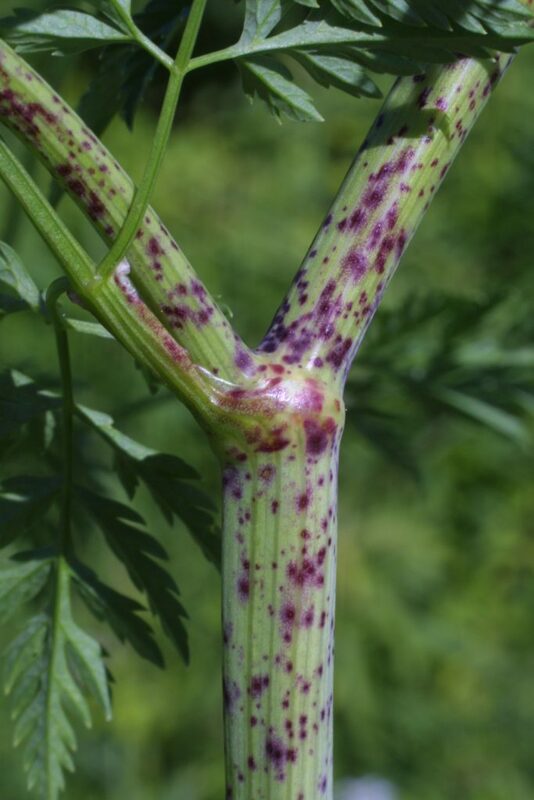 Conium maculatum stem.cas.vanderbilt.edu (Accessed 12/2014). 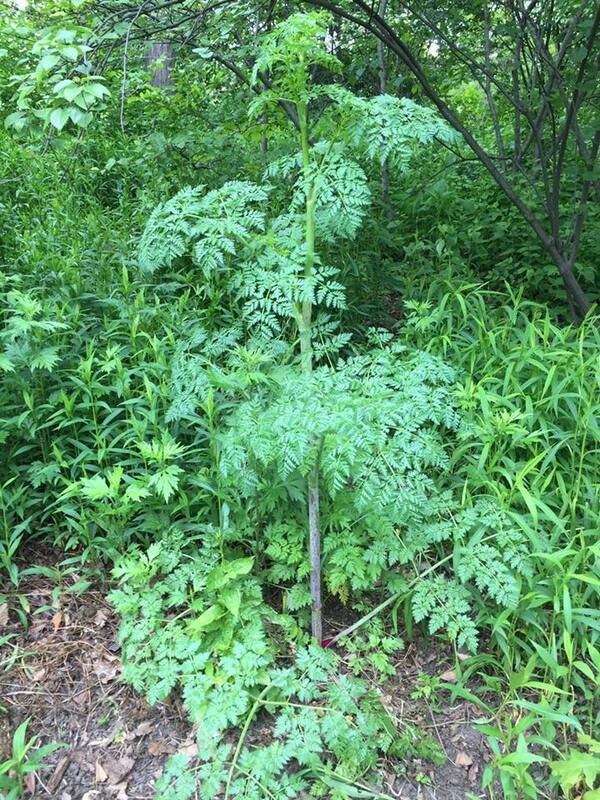 Conium maculatum is a biennial herb to 3 m tall, from a white, fleshy taproot, very poisonous, with a distinctive, unpleasant, “mousey” odor; stem stout, stiff, hollow between nodes, freely branched, purple-spotted. Leaves alternate, to 40 cm long, 3-4 times pinnate, broadly triangular in outline, much dissected, fern-like, ultimate segments to 1 cm, egg-shaped, margins toothed or lobed. Flowers white, small, no sepals, in umbrella-shaped clusters to 6 cm wide; blooms June-Aug. 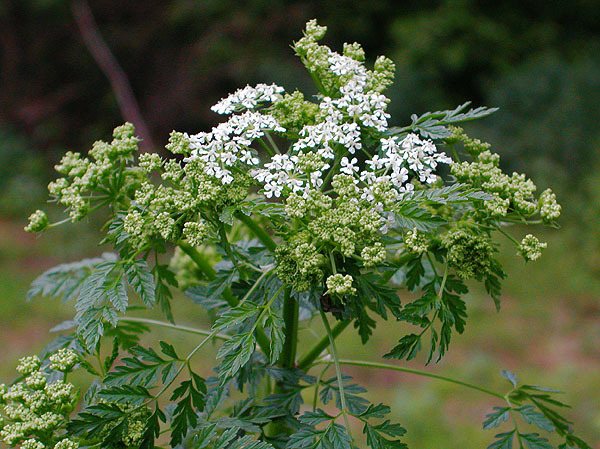 Appearance similar to Daucus carota, which is a smaller, hairy, upland herb. Fruit dry, egg-shaped, 0.3 cm, with knotty ribs, prominent when dry. Habitat: Marshes, moist to wet soil. Notes: This is the classical hemlock with which Socrates was executed. It contains at least five closely related alkaloids. One of these is coniine, a colorless, volatile, strongly alkaline oil, with a structure based on a pyridine nucleus. This is also referred to as a monocyclic piperidine (Harborne 1988). It consists of a 6-sided, saturated ring with one nitrogen, 5 carbons and a 3-carbon side chain. This compound accumulates in the seeds, while other variations (particularly lamda-coniceine) accumulate in vegetative tissues. This alkaloid is closely related to nicotine and poisoning produces similar central nervous system depression terminating in paralysis, coma and death (Kingsbury 1964). Apiaceae of open sites are eaten by larvae of the black swallowtail butterfly, Papilio polyxenes (Papilionidae); (Tallamy 2003; Pyle 1981).